Restricted to New Zealand, where it occurs throughout the North and South Islands, as well as Stewart Island. Its depth range is from the low intertidal to 50 metres subtidally. 24 mm specimen, from the low intertidal, Takatu Peninsula, north Auckland, New Zealand, 12 November 1977. Photo: Richard Willan. The cerata of Janolus novozealandicus, which are slim and circular in cross section, look smooth to the naked eye, but they actually have very small, sparse, pimples over their surface, except for the upper third. The tips of the cerata are pointed. The digestive gland extends, as a “lumpy” (but not branched) central rod, to the tip of all the cerata. The body is translucent and speckled with brown and it has a distinctive series of large, opaque, roughly diamond-shaped white patches down the back that are continued as a white streak down the upper side of the long tail. 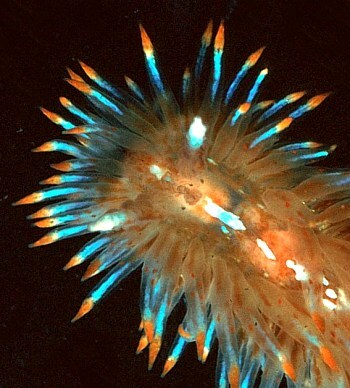 The cerata are so translucent that the multicoloured digestive diverticulum can be seen easily through their walls: the base is brown, the middle third is pale blue, and the upper third including the extreme tip is orange. Janolus novozealandicus is capable of casting off (autotomising) its cerata when it is provoked, but it does not do this readily. • Willan, R.C. 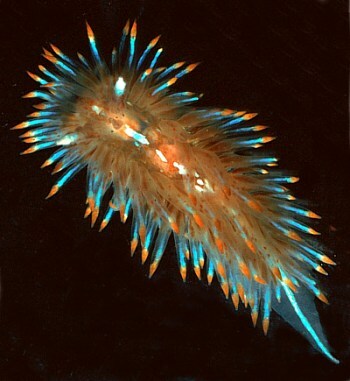 & Coleman, N. (1984) Nudibranchs of Australasia. Australasian Marine Photographic Index, Caringbah, Sydney, 56 pp. • Miller, M.C. & Willan, R.C. (1986) A review of the New Zealand arminacean nudibranchs (Opisthobranchia: Arminacea). New Zealand Journal of Zoology, 13: 377-408.